Auction prices today are very hard to figure. I talked at length with Dennis Hoff of Hoff-Hilk Auctioneers about his May 26 sale at Bystrom Precision, a small CNC shop in Minneapolis. The magnet pieces in the 150 lot sale were three L-20 Citizens, Type VII new in 2000 with Iemca Genius barloaders. Hoff says he told the client the sale price for each of those machines would be in the $30,000 to $40,000 range. The day after a long Memorial Day holiday is a lousy day to do an auction because people are just getting their plants up and running. An hour before closing, the prices were a little above dirt. Hoff told me that the seller was distraught as he looked at the disappointing numbers on the screen, but suddenly the bidders started waking up. In the last few minutes of bidding, the Citizens spurted from $12,000 to an average of $60,000 for each of the three machines with barfeeds. The Royal Master centerless grinders brought $15,000 for one and $20,000 for a second, and a one of a kind model went for $5000. Uglier ones sold in Canada a month earlier for $500 each. 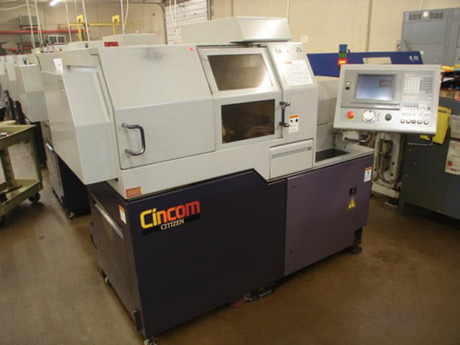 There were three small Brother TC31A drilling and tapping machines which sold for an average of $11,000 each. A Daewoo Lynx 200A turning center fetched $12,000, and a Eurotech 7 axis 420SLL with a 1-3/4” bar capacity new in 1999 brought $33,000. The weak sisters of the sale were three Nomura CNC Swiss Model NN13-SB, which scored $10,000 bids, with Fedek loaders hitting around $2000. This auction is no definitive marker of the beginning of a turnaround—it may be more a function of shrewd marketing by Hoff-Hilk. But on one day in May, the machining world looked brighter. Question: The Consumer Confidence Index had a big bounce Tuesday, are you seeing anything positive?